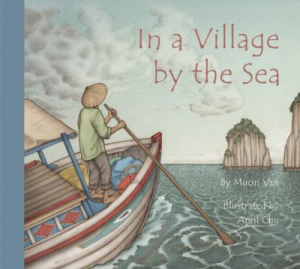 This week’s featured picture book is a new title that’s sure to become a classic, Muon Van’s In a Village by the Sea. This circular tale set in a Vietnamese village is short, sweet and simple enough to read to the littlest of book lovers, but the absolutely beautiful illustrations by April Chu will keep all ages interested. Check this book out for its stunning color palette, emotionally-drawn characters (including an endearing dog as well as an artistic cricket painting an ocean scene with four hands), and beautiful details on each page. Be warned: this is a book that begs to be read more than once a sitting, but the striking images and rhythmic words are still great after multiple views.